Beautiful Original Painting on Canvas "Swan Lake". Swan Lake is a ballet fashioned from an ancient German legend, which tells the story of Odette, a princess turned into a swan by an evil sorcerer's curse. 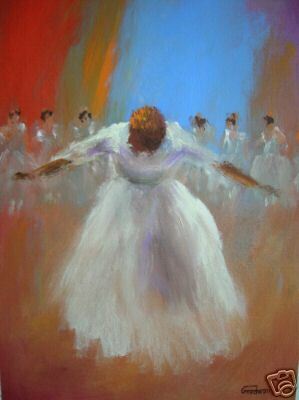 It was originally choreographed by Julius Reisinger to the music of Pyotr Ilyich Tchaikovsky............... BY THE SUPERB LEON GOODMAN WHO IS AN ACCOMPLISHED ARTIST HAVING BEEN A FINALIST AT THE GARRICK-MILNE PRIZE.HE HAS MANY OF HIS WORKS SOLD AT CHRISTIES. Measurements height 16.5 inches by 11 inches.